Have you ever left a piece of colored paper on a sunny windowsill, and turned it over some days later to find that the top side had become much lighter than the bottom? 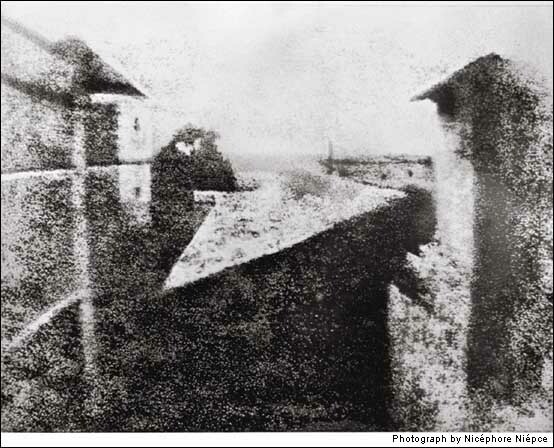 This manually enhanced grainy image is believed to be one the earliest surviving photographs, or “light drawing,” created by a French inventor named Nicéphore Niépce. Niépce discovered that he could use a camera obscura to “draw light” onto a metal plate he had treated with chemicals to make it more light sensitive. A few years later, Louis Daguerre, another French inventor, reduced the needed exposure time to just a few moments, and modern photography was born. Nicephore, Niepce. , Pigeon House and Barn, 1827. Accessed 27 July 2010. Abrams Encyclopedia of Photography. Ed. by Brigette Govignon. New York: Harry N. Abrams, Inc., 2004.